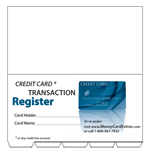 This nifty little debit card register is designed to fit right into one of the money card sleeves in your wallet for quick easy access to your account information. It's slim enough so that the whole register will fit compactly in the sleeve, or you can insert only its back cover into the sleeve, leaving the booklet's pages readily accessible for quick reference. 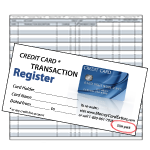 Being of small size there is only a single column for amounts, and the text in the heading of the amount column -- "Amount Of Payment Or Withdrawal" -- suggests that only transaction amounts are designed to be entered there. But that is because, again, there is too little space to print all the purposes the amount column could be used for. 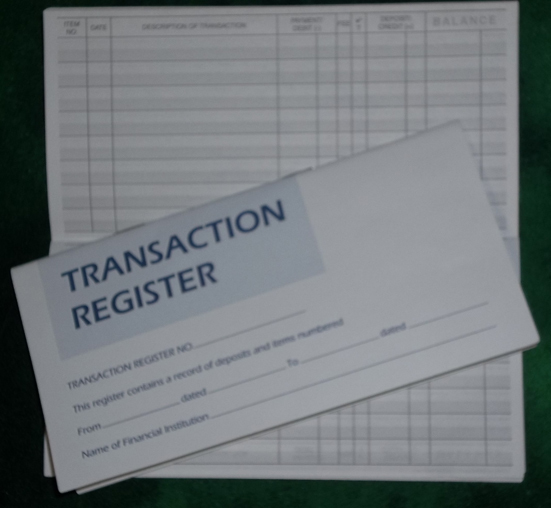 Hence, this little register can actually handle all types of transactions -- not only payments and withdrawals but also deposits and running balances (you would need to choose a double-line method in order to include and update your balances). We are working on a couple of wallet size designs that will improve on this and have also the capacity to track multiple debit (and credit) cards, but, for the meantime, this is a great little register to keep your debit card transactions and balances at your fingertips. 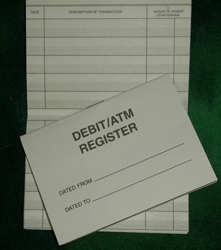 This register can also be re-purposed to keep track of a credit card's transactions and either its debt balance OR available credit (only one of these since there is only one amount column). 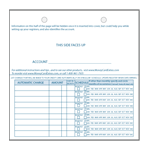 Simply cross-out neatly and change the title on the cover and the text heading the amount column. Also remember to keep the arithmetic logic straight: if you decide to track the debt balance, charges are ADDED and payments are SUBTRACTED. 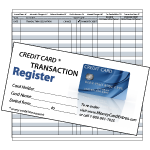 If it's the available credit you decide to track, charges are SUBTRACTED and payments are ADDED. A few security tips on the inside of the back cover.